A lot of my posts recently have been about my recent trip to the capital and this is no exception. I thought I would share a few of my recent purchases with you as I am absolutely loving everything I picked up. 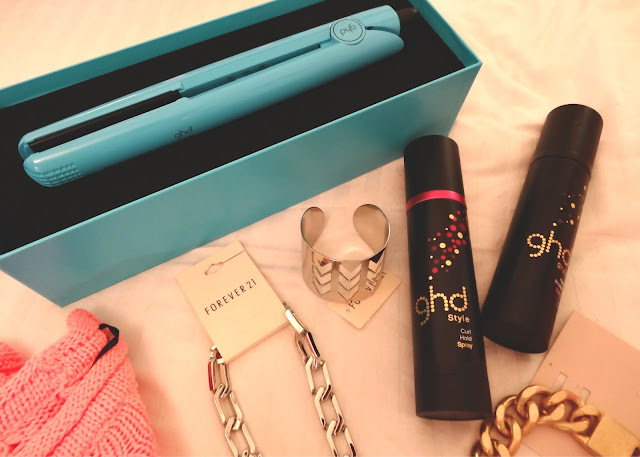 The ghd’s were a gift as was the heat protect spray, so they weren’t technically bought but still, they came back with me in a little products bag so I thought I would include them. I picked up the ghd curl hold spray however as I used it as the ghd event and it was amazing at holding my curls for the remainder of the weekend without hairspray, so I invested. The jumper I am in love with. It is a bright, almost neon peach colour in a large holed knit, so you can see any under garments vaguely poking through, so a t-shirt would definitely be wise with this. But it was £20 from H&M and I literally made a bee line for it across H&M when I saw it stand out brightly. The lingerie is from Victorias Secret and I was so excited to buy them. Being from the North, we don’t yet have a VS nearby, so this was my first Victorias Secret experience. Plus, being called Victoria myself, this has always been a brand I wanted to buy into (don’t ask). The bra is a gorgeous bright almost neon peach and pink and was £50. Pretty steep but I loved it, it fit beautifully and has the softest material inside so I treated myself. The thongs were three for £24 I think, so I picked up two that would match and a plain black, as you cant have enough black underwear if you ask me. 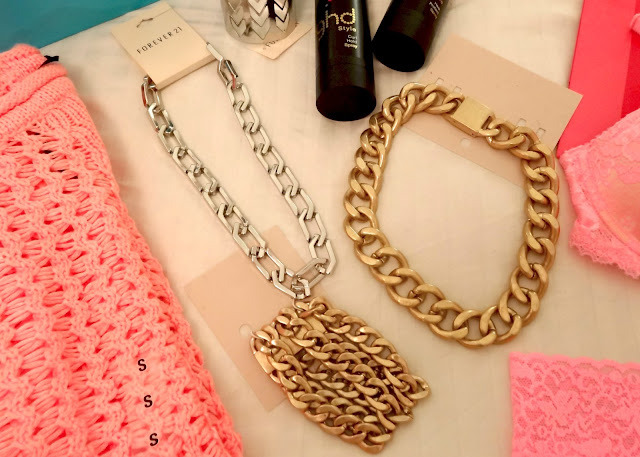 The large gold chunky necklace and matching three band bracelet were from H&M and cost £20 and £10, but are perfect for the chunky jewellery trend. These I bought for my flatmate as I am a silver jewellery girl myself, but she loves them. So I picked up the Forever 21 linked silver necklace and silver chevron band for me which were around £10 and £5 I think. Hope you like what I picked up!